Don't let zombies get close. Pretty simple huh? For those who want the advanced version there are some standard 'zones' used in martial arts and law enforcement that are worth being conscious of. There are a few versions of these zones and the spacing will vary and are also dependent on your body size. Taller people will have a slightly longer reach. Stronger people will be able to hold a longer chainsaw. 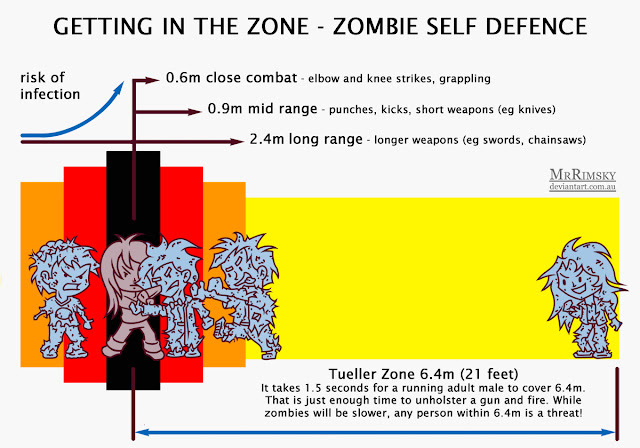 Not only do these zones dictate what techniques and weapons you can use, there is also changes in the level of risk. Now some martial artists may argue that being in really close with an attacker is actually safer, because this limits the attacker's power and techniques. A skilled fighter can then use this to their advantage. However, with zombies the closer they are the higher the risk of you getting infected. You may defeat a zombie in a close combat fight, but all that grappling means scratches, bites and body fluid splatter. So go all Daryl Dixon and crossbow* the undead before they get close enough to harm you. * Note crossbows are illegal in Australia but in America you can buy them at Walmart.